The WAMA Foundation aims at globally improving the capabilities of medical professionals and to provide access to medical (sub-)specialties in order to contribute to better healthcare worldwide. By investing in training and education, patients will ultimately receive a higher standard of healthcare quality. The transfer of medical knowledge involved in this process, can be achieved through different channels, by, for example, assisting local specialists in surgery or by drafting medical protocols for the transfer of knowledge. The aim is to develop practical solutions to concrete and relevant problems together with local medical communities within the local economic and socio-cultural context. Besides the transfer of medical knowledge, the WAMA Foundation also strives to improve the local infrastructure for medical education. Improving the infrastructure of medical education provides continuity to the transfer of knowledge. Investing in medical education, moreover, is essential for the future of healthcare. In order to improve healthcare, the practice of advanced medical care desperately needs the contributions from scientific research, both clinical and epidemiological. 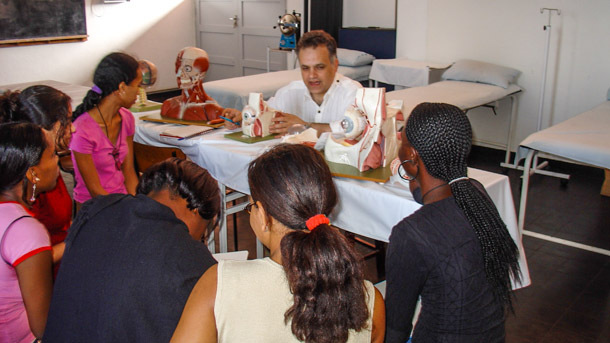 It is essential to the development of an adequately functioning model of medical care. Hence, one of WAMA’s core activities is the realisation of partnerships for improving the infrastructure for scientific research in developing countries.